Ahhh... Relax in Durango, Colorado. Whether you've spent your day skiing, biking, horseback riding, rafting, camping or exploring, Durango provides many opportunities to indulge at day spas, hot springs or both. Some even have salons. After, dine in one of the area's fine dining restaurants plus stay at any of the fabulous Durango hotels and go to bed fully satisfied. 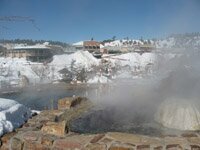 Pamper yourself at the famed Pagosa Hot Springs! You won't want to miss The Springs Resort Bath House, visited by Oprah Winfrey, which offers 23 hot mineral pools ranging from 84-114 degrees. And, if a good soak just isn't enough, the resort offers a full menu of massage and spa therapies, as well as hair, skin and nail salon services. Towels, robes and lockers are available. Relish a day trip or really spoil yourself with a stay in the 79-room boutique hotel; guests enjoy complimentary access to all pools. Eat organic health food. Shop. Relax. Restore. Another place to sooth mind and body. The Trimble Spa & Natural Hot Springs, only 5 miles north of Durango, offers therapeutic pools, low-key lodging and holistic massage and body treatments. The heated outdoor 50-meter pool (open Apr-Oct) has a poolside lawn that's perfect for picnics, sunbathing and get-togethers. Two saunas, naturally heated mineral-rich pools and spectacular mountain views will add to your relaxation and renewal. In the heart of downtown Durango. Spaaah is a fun and friendly day spa. With massages (including Hot Stone Massage), facials, wraps, scrubs, waxing and other treatments, as well as nail services, Spaaah may prove the perfect vacation treat. Escape into a serene setting of woods and bamboo. Amaya Natural Therapeutics provides services designed for deep relaxation. In addition to an array of body soothing massages, this unique day spa offers time-well-spent in their large salt water hot tub (106°), cold plunge (55°), and dry sauna (135°-150°). Other health-related therapies also available. Hair today, massage tomorrow. Head down to 6th St. Hair Salon & Day Spa for a full-service selection of treatments for hair and body. Freshen your cut or color. Get a winter tan. Indulge in a mani-pedi, facial or massage. Even update your look with a complete make-over. Packages available.